Girls, Girls! Now don’t make me have to separate the two of you! 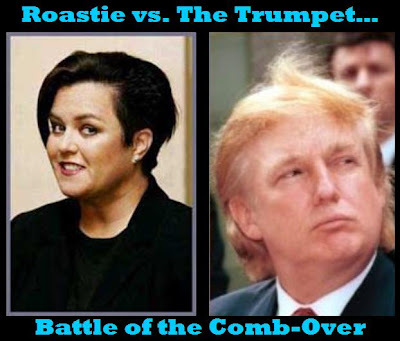 With all the hoopla (my favorite word) surrounding Miss USA and Donald Trump lately, Rosie O’Donnell decided to call Trump a “snake-oil salesman.” OH SNAP! Wait a minute, what the hell is a snake-oil salesman. Uh, and Rosie? Shouldn’t it be a “snake-oil salesperson?” I figured you would be the first to say that women can sell too. Hahaha seriously the more I read that, the harder I laugh. Did he mean that to be funny because it actually was. The only thing that he was missing in that statement was, “The Apprentice on NBC.” I love it all. If they could somehow settle this on Judge Judy, both my Tivo and I would be very happy. Donald: Dearest Rosie, What's Up?